From 1953; illustrated by Helen Szepelak. Timothy watched the clock for a long while. It ticked so slowly! This was his birthday and nothing was happening. He went to the kitchen and sniffed. But there was no good birthday cake smell. "Mother," he asked, "are you sure you haven't forgotten what day this is?" "No I haven't forgotten," Mother said with a mysterious smile on her face. "It is your sixth birthday, and I promised you a surprise. It will be here at two o'clock. Just seven more minutes to wait." CLANG, CLANG, CLANG! What was that? 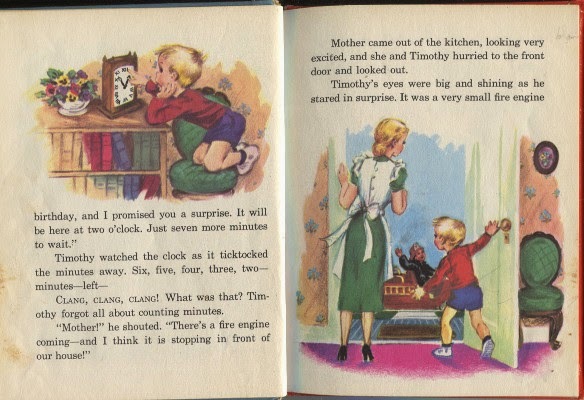 Timothy forgot all about counting minutes. "Mother!" he shouted. "There's a fire engine coming--and I think it is stopping in front of our house!" Mother came out of the kitchen, looking very excited, and she and Timothy hurried to the front door and looked out. Timothy's eyes were big and shining as he stared in surprise. It was a very small fire engine but as red and shiny as it could be! A man wearing a fireman's suit and a fire helmet on his head jumped out of the truck and came up to Timothy's front door. "Timothy Brady?" he asked. "Yes," Timothy said. "I have come to take you to Funland in the Happy Birthday Fire Truck." "Is it all right if I go?" Timothy asked his mother. "Of course," she said. "This is your birthday surprise." Timothy ran out to the fire truck and was just climbing in when--"HAPPY BIRTHDAY!" came from the back of the truck, and four heads popped up. "It is Don and Jean and Terry and Mary Ann!" Timothy shouted. "Your mother invited four of your friends to come along," the fireman said. Timothy jumped in and sat down on one of the little seats in the back of the fire truck. With a CLANG, CLANG! the fire truck drove away. The children shouted and waved happily at the people on the street and at Timothy's mother who was following in her car. Out to the edge of town sped the little fire truck, and at last it stopped. "We're here!" shouted the children. "We're here!" "Welcome to Funland," the fireman said. 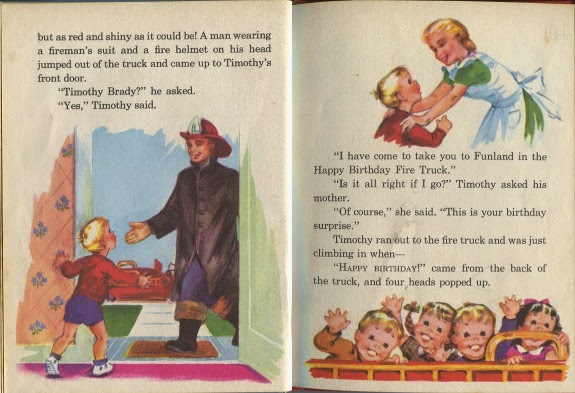 The children jumped out of the fire truck and waited for Timothy's mother. "Here are your tickets," she said, and gave each one a long string of tickets. They scampered ahead of her into the amusement park. What a wonderful place it was! 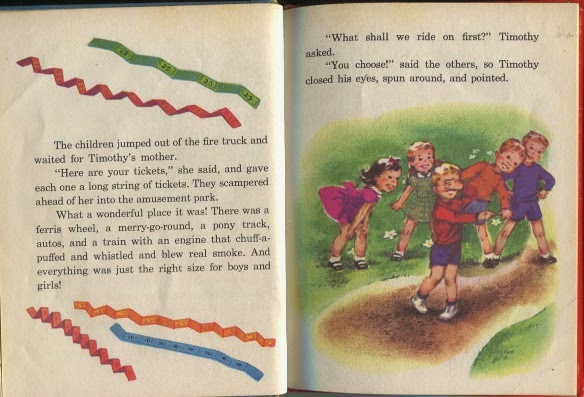 There was a ferris wheel, a merry-go-round, a pony track, autos, and a train with an engine that chuff-a-puffed and whislted and blew real smoke. And everything was just the right size for boys and girls! "What shall we ride first?" Timothy asked. "You choose!" said the others, so Timothy closed his eyes, spun around, and pointed. "The ferris wheel!" Mary Ann shouted. They ran toward the gate, handed in their tickets, and while Timothy's mother watched nearby, they climbed into the little seats. Up, up, and over--down, down, and around went the ferris wheel. The children looked over the tree tops and down on the street and at the other children running about in Funland. Far below was Timothy's mother waving to them. They waved back. When the ride was over, Timothy asked, "What shall we do next?" "Let's ride on the ponies!" Don and Terry said together, so the children raced to the pony track. The man who took care of the ponies smiled and said, "My, but you look happy today!" 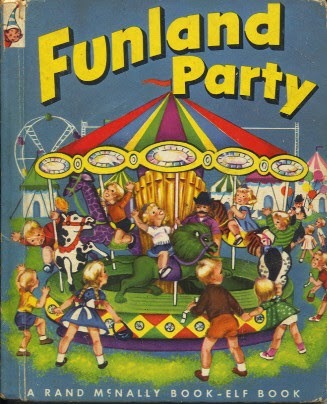 "It is Timothy's birthday, and his mother is giving us a party in Funland," Jean said. "That's why we're so happy!" "Well, pick out the ponies you want to ride. The fast ones are over there and the slower ponies are right here," said the man. "We want the fast ones," the children cried and ran to the other side of the track. They picked otu their ponies and climbed into the saddles. Around the track the ponies trotted, heads bobbing and saddles squeaking, while the children whooped and shouted like cowboys. 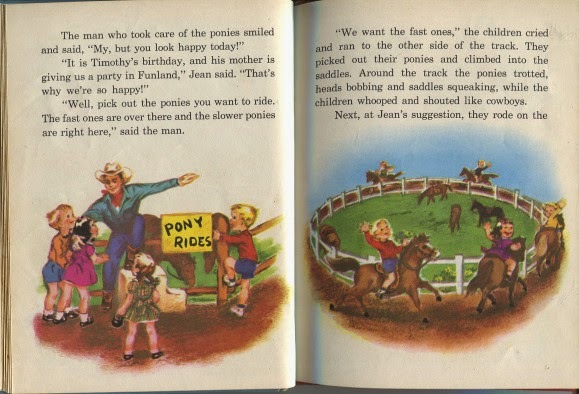 Next, at Jean's suggestion, they rode on the merry-go-round. What a time they had trying to decide which of the painted animals they wanted to ride! There were purple giraffes, green lions, red tigers, and black and white horses. But at last they were ready. 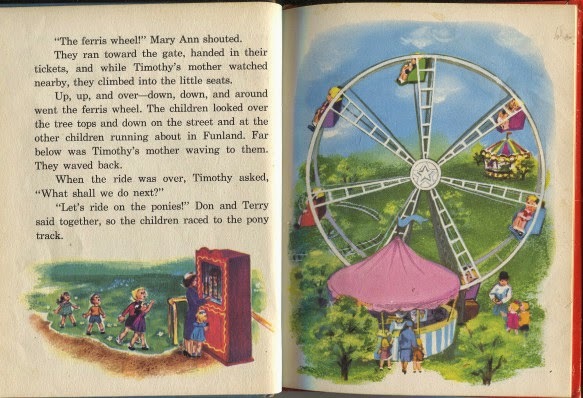 The music started, and up and down, around and around, went the brightly colored merry-go-round. 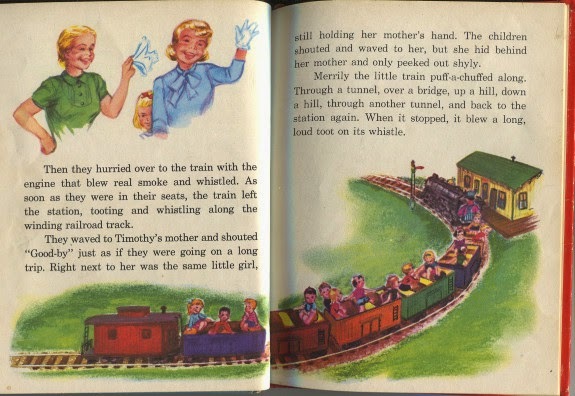 The children waved to Timothy's mother. A little girl who was standing near, holding her mother's hand tightly, watched them. They waved to her, but she didn't wave back. 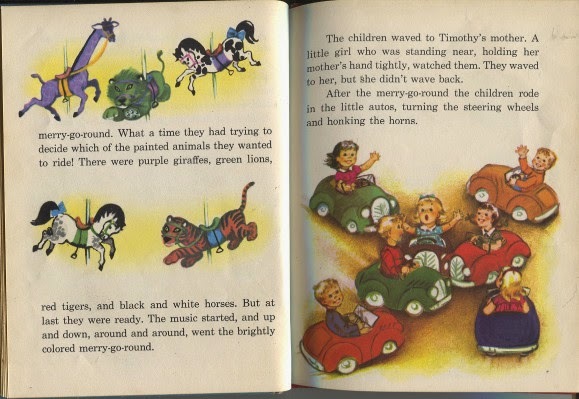 After the merry-go-round the children rode in the little autos, turning the steering wheels and honking the horns. Then they hurried over to the train with the engine that blew real smoke and whistled. As soon as they were in their seats, the train left the station, tooting and whistling along the winding railroad track. They waved to Timothy's mother and shouted "Good-by" just as if they were going on a long trip. Right next to her was the same little girl, still holding her mother's hand. The children shouted and waved to her, but she hid behind her mother and only peeked out shyly. Merrily, the little train puff-a-chuffed along. Through a tunnel, over a bridge, up a hill, down a hill, through another tunnel, and back to the station again. When it stopped, it blew a long loud toot on its whistle. As the children jumped off the train, they saw the little girl still watching them. They walked over to her. "Don't you want to ride on something?" Jean asked her. The little girl backed away and didn't answer. "We live in an apartment building, and Ellen doesn't have anyone her age to play with," Ellen's mother explained. "That is why she is shy." 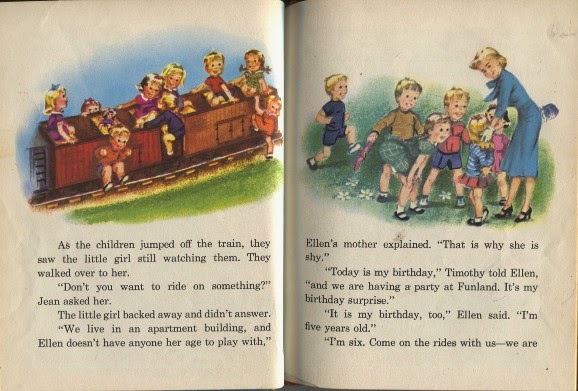 "Today is my birthday," Timothy told Ellen, "and we are having a party at Funland. It's my birthday surprise." "It's my birthday, too," Ellen said. "I'm five years old." "I'm six. Come on the rides with us--we are going for the second time--and it will be a double birthday party," Timothy invited her. But Ellen held tightly to her mother's hand, so the children turned away. 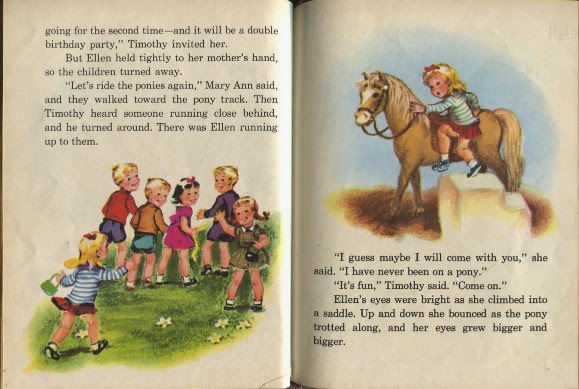 "Let's ride the ponies again," Mary Ann said, and they waled toward the pony track. Then Timothy heard someone running close behind, and he turned around. There was Ellen running up to them. "I guess maybe I will come with you," she said. "I have never been on a pony." "It's fun," Timothy said. "Come on." Ellens eyes were bright as she clombed into a saddle. Up and down she bounced as the pony trotted along, and her eyes grew bigger and bigger. After the pony ride they took Ellen on the ferris wheel. She held tightly to Mary Ann's hand and looked all about her as the wheel went up and around and down again. 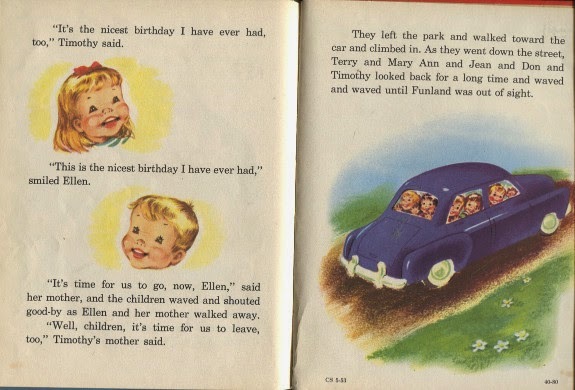 Then they rode in the little autos, and Ellen steered the wheel and honked the horn. And on the merry-go-round Ellen rode a purple giraffe and laughed louder than anyone else. She didn't look the least bit shy anymore. The children used their last tickets to ride on the little train. As they were getting on, Timothy's mother said to the engineer, "We have two birthday children today. Could you let them toot the whistle once or twice?" "Why, sure!" the engineer said. "I will even let them help me run the train." Ellen and Timothy sqeezed into the seat next to the engineer. He showed Timothy which lever started the train, and he showed Ellen which lever puffed out the smoke and blew the whistle. Soon the other children were safely in their seats and away they went. 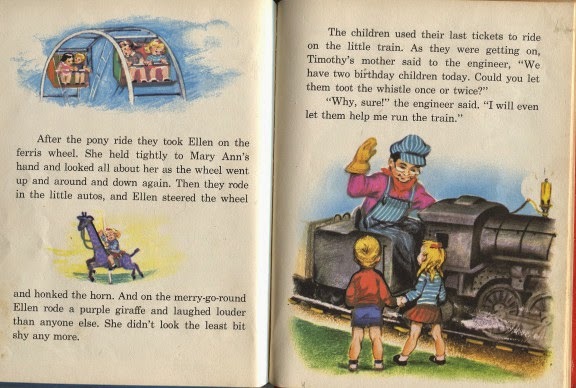 Through a tunnel, over a bridge, up a hill, and down a hill they went, through another tunnel, and back to the station, while Ellen and Timothy blew the whistle, puffed otu the smoke, and helped to run the little train. After the train ride it was time to eat. 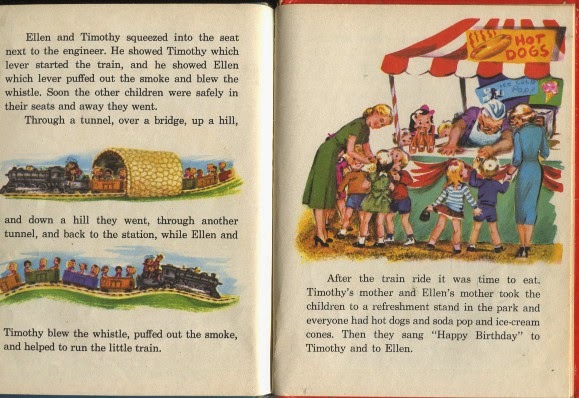 Timothy's mother and Ellen's mother took the children to a refreshment stand in the park and everyone had hot dogs and soda pop and ice-cream cones. Then they sang Happy Birthday to Timothy and Ellen. "This is the nicest birthday I have ever had," smiled Ellen. "It's the nicest birthday I have ever had, too," Timothy said. "It's time for us to go, now, Ellen," sais her mother, and the children waved and shouted good-by as Ellen and her mother walked away. 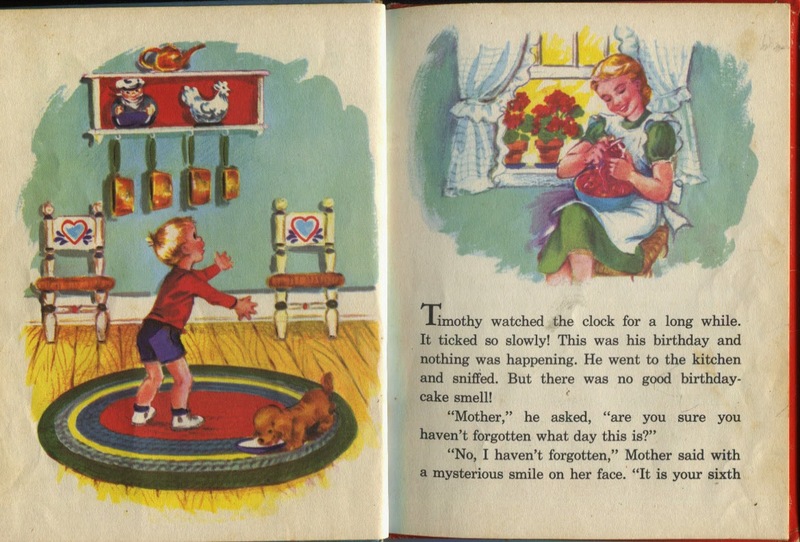 "Well, children, it's time for us to leave, too," Timothys' mother said. They left the park and walked toward the car and climbed in. 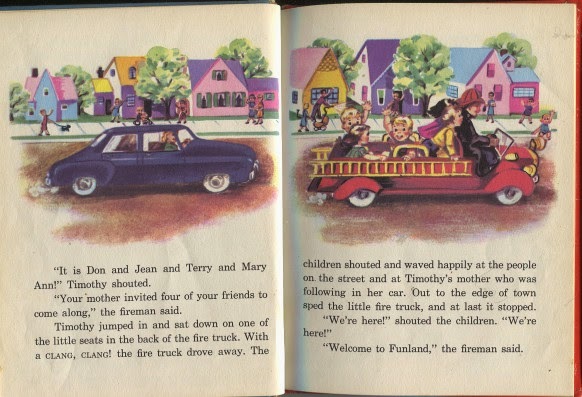 As they went down the street, Terry and Mary Ann and Jean and Don and Timothy looked back for a long time and waved and waved until Funland was out of sight.